When DNA in the cell nucleus gets damaged, our cells can resort to a variety of repair mechanisms. A recent study, to which scientists from Helmholtz Zentrum München made major contributions, elucidates the molecular basis by which a cell makes the choice between these repair mechanisms. The trick the scientists used: they developed a molecular bait to literally fish out the relevant proteins from the cell nucleus. According to the authors, this study opens up new possibilities for cancer therapies in the future. The sequence of base pairs in the DNA contains the genetic information of all living things. Not all genes, however, are active at the same time ­- this also depends on other factors that are happening around the DNA. Histones play a major role in this. "Histones are proteins around which our DNA is wrapped and which thus serve to package the genetic material," says corresponding author Dr. Till Bartke, deputy director of the Institute of Functional Epigenetics (IFE) at Helmholtz Zentrum München. "Depending on how the histones are chemically modified, they can have different effects on the DNA and control gene activity." The primary aim of Bartke and the IFE is to find out how this so-called 'histone code' works. To achieve this, the researchers reconstruct known chemical histone modifications in a test tube and investigate which proteins selectively bind to them in an extract made from the nuclei of cells. "Put simply, we build a molecular bait with defined histones and use it to go fishing in the nucleus ­ and then it gets exciting to see what we will have on our 'hook'," says Bartke. In their current research work, Bartke and his team used this method to search for proteins that bind specifically to newly formed chromatin. "The idea was to identify proteins that are able to differentiate between old and new chromatin and that therefore have a function in the replication and repair of DNA," says the molecular biologist. The researchers found a group of structurally related enzyme complexes that are involved in the cell's choice of DNA repair pathway. In further investigations, Danish colleagues led by Anja Groth at the Biotech Research and Innovation Centre (BRIC) of the University of Copenhagen elucidated in detail which proteins and structural elements participate in the cell's decision which of the different DNA repair mechanisms to initiate. The key element in this repair process is an enzyme complex associated with BRCA1 (abbreviation for 'Breast Cancer 1'), a gene which has received considerable attention as a risk marker for breast cancer. "Carriers of mutations in the BRCA1 gene have an increased risk of developing breast or ovarian cancer because their DNA damage repair system is faulty, and this in consequence can lead to an accumulation of further harmful mutations. However, cancer patients who carry mutations in the BRCA1 gene can be treated with PARP inhibitors, a class of drugs that are particularly effective in these patients," says Bartke. As part of the publication, British scientists led by Ross Chapman at the Wellcome Centre for Human Genetics in Oxford then specifically investigated the effects of mutations in the BRCA1 complex, focusing on the part responsible for the recognition of the newly formed chromatin. 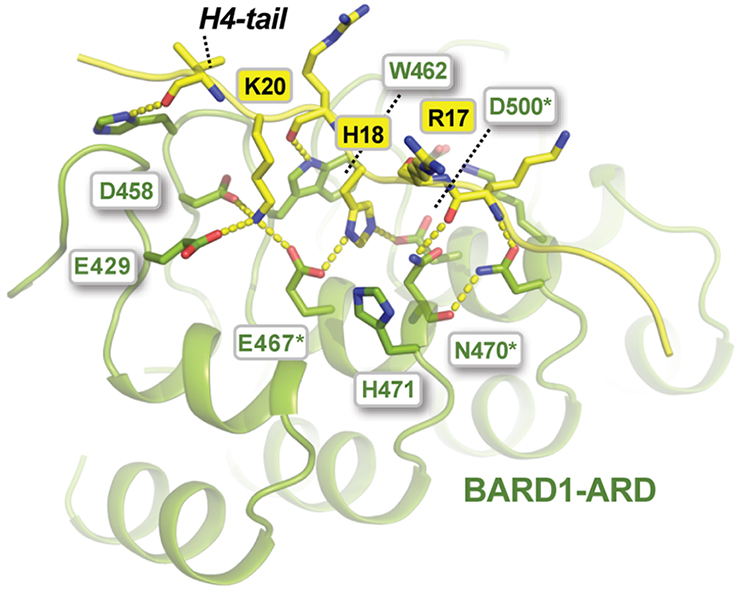 Cells in which this region was inactivated could be killed very effectively by a PARP inhibitor. "Due to the collaboration of our three research groups, we now know the exact function of these important DNA repair proteins, and with the chromatin binding site of the BRCA1 complex we have already identified a target structure that we can use for medical intervention in order to treat cancer patients. Using small molecules, it would for example be possible to imitate the BRCA1 mutation and thereby make PARP inhibitors usable for a broader spectrum of patients that do not carry this mutation." A promising start has been made, says Bartke, and companies are already developing such molecules.